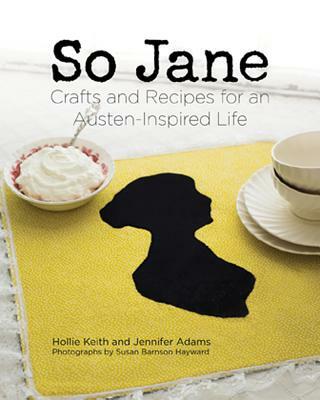 For the Jane Austen enthusiast, or quite simply all the "Janeites" out there, So Jane will help them bring all things Austen into their homes, be it decorating, gift giving, or entertaining. With 30 craft ideas and 30 recipes organized into six chapters bearing the titles of Jane Austen's novels, enthusiasts can enjoy breakfast in Bath, via Northanger Abbey by creating Decorative Egg Cozies to keep their Soft-Boiled Eggs warm, or serve Honey-Lemon Teaspoons with Rose Petal Tea at the Middleton's of Sense and Sensibility. Enjoy a picnic that Emma would love to have shared with Mr. Knightly, or create an I Heart Mr. Darcy Pillow that all Elizabeth Bennett wannabes would love to cuddle up with. Hollie Keith has had a passion for crafting beautiful things and reading classic literature since she was a child. She has worked as an editor for more than ten years and is editor-in-chief of LittleMissMarmalade.com, a blog dedicated to crafts, DIY, and surface pattern design. She lives with her family near Salt Lake City, Utah.